My procrastination knows no bounds this evening. I should be conducting research on space planning. I should be assessing suitable pieces of furniture for an office space and I should be devising development sketches. Instead I’m focusing on the internal decorative elements of the various rooms within the overall space. Yes, I’m bad. I’m very, very bad. I mentioned in previous posts that for my current module (Georgian Townhouse located in the Lace Market of Nottingham… you should know this by now!) I wasn’t really going to incorporate an awful lot of typical Georgian design. And I changed my mind and decided to use a fabulous and innovative contemporary Damask wallcovering to bring a fresh twist to this traditional pattern but also to reinforce the Georgian period of the building. Well, I’ve decided to explore the inclusion of Georgian elements further. I can’t help it! Georgian detailing can be utilised so seamlessly with contemporary design and its elegance undoubtedly helps to soften the perceived harsh edges of the ‘contemporary’. One of the rooms that I must include in this commercial/office space is a staff ‘breakout’ space. We’ve all witnessed various staff ‘breakout’ zones throughout our working lives and I’m sure you’ll agree that they are typically uninspiring, sometimes quite ‘modular’ in design and basically lacking in any form of creativity. As an interior design undergraduate I don’t want to follow that pattern. I’m much more interested in pushing boundaries and making the most of my creative juices to visually entice and stimulate. This space will be primarily centred around industrial styling but with considered injections and glimpses of Georgian styling but in a quirky manner. So, my design for the staff ‘breakout’ area will continue with the theme of industrial styling by having original (or reclaimed) floor boards in their natural/untreated state and… cue drum roll… its walls will be adorned with a fantastic Designer’s Guild wallcovering that gives the impression of old tatty walls. Genius! 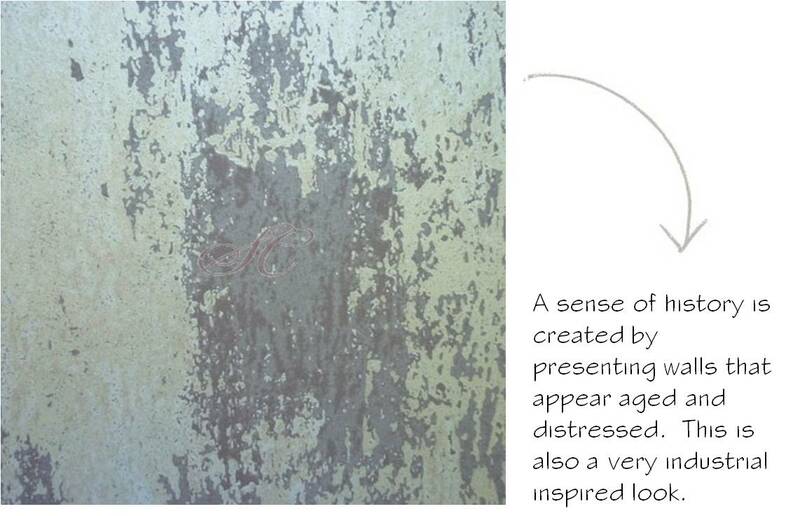 This wallcovering is supposed to represent a wall with a little bit of history – layers of paint that have gradually faded and/or peeled to show the wall itself. You can’t really get much more ‘industrial inspired’ than that! I love the idea of walking into a room and being able to see the history of its decoration in an untouched and rustic manner. 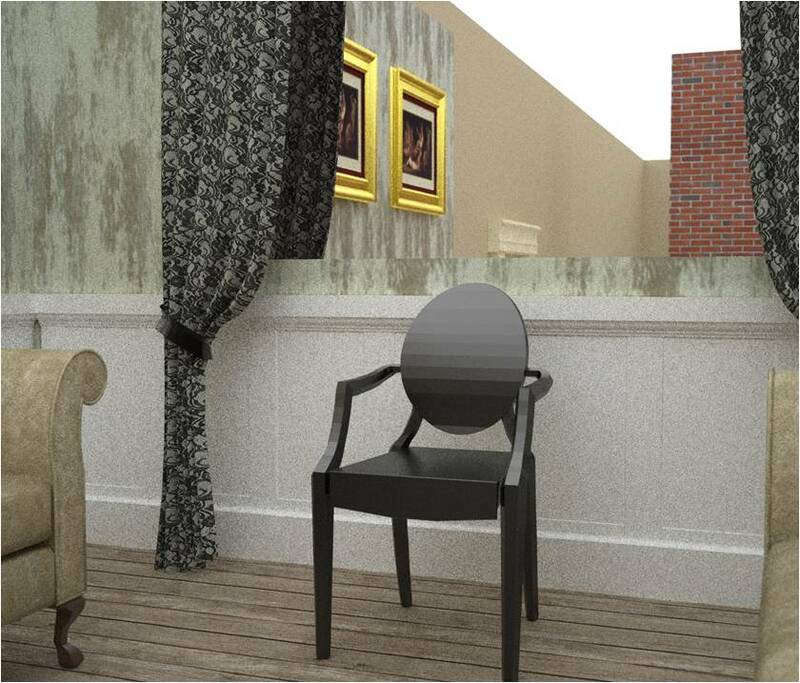 I have also softened this a little by adding traditional wall panelling up to chair rail height to further emphasise the Georgian influence of this property. To ensure that these walls aren’t too cooling I’ve also warmed up the space by including very elegant and sophisticated camelback sofas in a very tactile and luxurious suede fabric. I love the idea of incorporating a piece of iconic furniture that represents the luxurious trappings of the Georgian era within a space that has a very industrial and slightly harsh edge – it’s very unexpected and a great contrast. The Georgians were known for their love of gold gilding so I have included a few gold picture frames (this will again help to add warmth and will provide stark contrast to the distressed walls). There are no windows in this space but why should that prevent me from including a window treatment?! I’ve decided to incorporate the use of lace via curtains (these will also be used on Roman blinds in the offices) and are situated in front of a mirror to try and open up the space and prevent it from feeling too boxy. I couldn’t resist knocking up a few 3D visuals of this space to see how it could look and I have to say; whilst it is visually unusual and unfamiliar; I absolutely love it. At the opposite end of this room there will be a small kitchen area and table/chairs. I have included the infamous Louis Ghost chairs by Philippe Starck because of their vague resemblence to the Shieldback chairs used in the Georgian era. This space will also be much more visually inviting with considered lighting but for a staff ‘breakout’ zone it successfully reflects a company that prides itself on being innovative and creative whilst acknowledging the history of the building.